For those who’ve been following my Feldenkrais training, my first segment began with lessons on sucking, revisiting our most primal movement in a considered way. Fast forward to my current segment: we’ve evolved enough to recite nursery rhymes, deliberately. Guest trainer Richard Corbeil, who began his career as an early music singer, has led us through a series of Awareness Through Movement lessons involving subtle differentiations of the breath, the head, the lips, and the tongue. At various times he’s asked us to recite either the entire Humpty Dumpty poem, or parts of it, so we can detect whether (and how) our movements have influenced the sounds of the syllables. Occasionally we’ve simply mouthed the words to discern if the lessons changed the flow or feeling of the breath. In regular life, most of us pay little to no attention to how speaking actually feels until we’ve overdone it and end up hoarse or with laryngitis. Unlike some of the more vigorous Awareness Through Movement lessons that involve rolling, twisting or maneuvering the whole body, whose challenge arises from moving in unfamiliar ways, the vocal integration lessons are difficult in their delicacy. Since I’m not a singer attempting to expand my range, or someone trying to work with a speech impediment, without a specific goal in mind I’ve had a hard time bringing my full attention to the nuances we’re exploring. More than once I’ve drifted off, reentering the lesson after a pause or partial snooze of uncertain duration. The brilliance of the Feldenkrais Method is that one can enter a quasi-dream state for part of a lesson and still get something out of it. And, in my ideal self-image, I’m bright eyed and eager to learn, not falling into semi-consciousness on the floor, even though it’s an experience common to many. But when Richard (pronounced Ree-shard) demonstrated some hands on work that we’d do with partners, using our hands to explore their faces, I suddenly perked up. Watching him gently move another student’s lips, nose, eyebrows and ears, not to solve or change anything but simply to explore the movement tendencies of these softer areas, had me riveted. The exercise reminded me of the Zen koan: what was your original face before even your parents were born? Would his touch reveal something of the person’s essence we hadn’t seen before? Faces, like the rest of the body, have their own habits, cultivated over years. Perhaps a person smiles more readily to the left than to the right, or frowns more easily to the right. Maybe one eyebrow moves in more directions than the other. Over the years, these habits etch our unique cartography. To play with these directions and, through gentle touch, suggest new ones, seemed akin to redrawing the map of the face, or allowing the face to redraw itself in ways that couldn’t be predicted. To make contact with another’s visage in a Feldenkrais way seemed both edgier and more intimate than, say, giving a facial, which has a specific sequence and goal. As someone who is still more than a bit awkward working with another person through their body, I noticed an uncharacteristic eagerness to get my fingers on my partner’s face and see what would happen. When we began, I observed that one of her eyebrows was higher than the other and her face held some tension. And, I knew that my task was to explore with my hands without trying to “fix” anything or create more symmetry (for that, there’s Botox, collagen or plastic surgery). When practicing the Feldenkrais Method, the quality of one’s attention, touch, and intention are enough to facilitate change, if a change is waiting or available to happen. As I carefully touched and moved my partner’s face as she lay on a table, I felt like an artist working with clay, able to hint at a new shape knowing that the final result was out of my control. At the end of our session, my partner said she felt more in her body, with less activity in her face. Her eyebrows seemed more even, although that had not been a goal. Her face appeared luminous, as if lit from within. That just 15-20 minutes of curious exploration had brought about such a marked shift made me feel like a magician, even though all I had “done” was pay attention and stay in the process, without setting an agenda. Looking around the room, I observed lots of glowing faces, yet nobody had visited a spa. 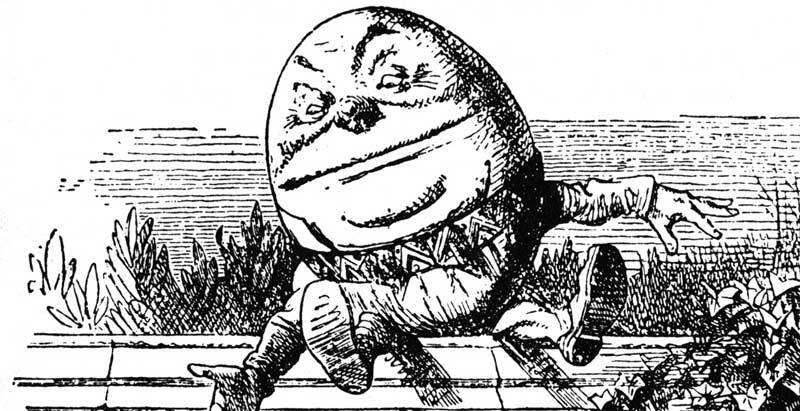 It occurred to me that several people I’ve met in both of my trainings had, like Humpty Dumpty, experienced – if not an epic fall – a series of smaller mishaps that created or contributed to unresolvable pain. Because none of the king’s horses or men (doctors, physical therapists, physiotherapists, chiropractors, podiatrists, surgeons, etc.) had been able to put them together again, they had decided to study the Feldenkrais Method. The beauty of this approach is that it does not put people together the way they were before, but creates new pathways for movement and learning. Moshe Feldenkrais taught himself how to walk with ease although he had irreparably damaged his knees. Since this method makes the “impossible possible”, I suspect that if all the king’s horses and all the king’s men had been Feldenkrais practitioners, Humpty Dumpty would likely be intact if not improved. We wouldn’t have had this rhyme as a strangely fitting refrain for the training, which again reminded me that seeming miracles can happen when we remember to be as curious and playful as children. Indeed, Feldenkrais is not just fun. It beats Botox, hands down. Wonderful post Ilona! I love glow you describe and the bit about how your partner could ‘feel more of her body with less activity in her face.” I also adore the part about the zen koan and your question: “Would his touch reveal something of the person’s essence we hadn’t seen before?” I am now enthralled with the idea of unveiling the unseen essence. Thanks, Buffy! It was a cool experience (also, being on the receiving end, too).